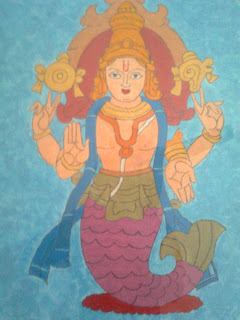 In his first incarnation, Vishnu has the lower part of the body like that of the fish (Matsaya) and the upper part like that of a man. He has four arms; with two he holds a conch shell & a wheel. While the other two are holding a lotus or a mace or are in the protection and boon giving modes.